31st October, Halloween. One of my most favourite days of the entire year. Everything is spooky, everything is set to scare and everyone gets to dress up! 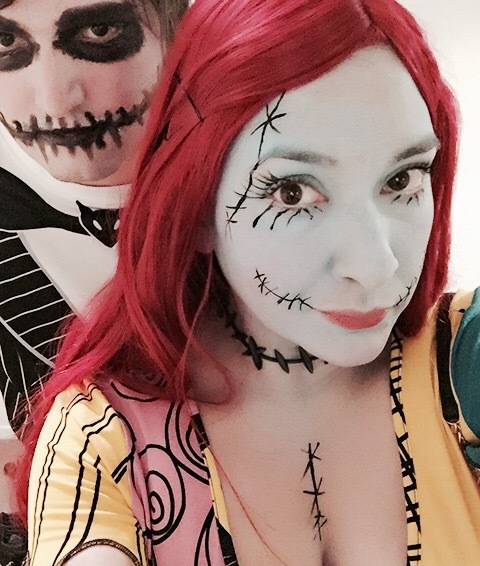 This year my husband and I decided to dress up as Jack Skellington and Sally from Disney’s dark “The Nightmare Before Christmas” (I love that movie SO much) and we decided to venture out to Stony Stratford to see what the annual zombie pub crawl was all about. What started off as a small group of friends getting dressed up as zombies for Halloween and staggering their way through the pubs of Stony Stratford, has evolved so drastically in the past nine years that it’s now one of the biggest nights in the MK events calendar. Last night seemed to be no exception. From dusk onwards the high street of Stony Stratford was brimming with zombies, creatures of the night and monsters from the abyss. It was quite a sight to behold. I was really impressed at how many people kept themselves in character to suit their costume. An ‘old lady’ was trying to push her shopping trolley up and down the high street, whilst looking for her cat, she definitely made me smile. 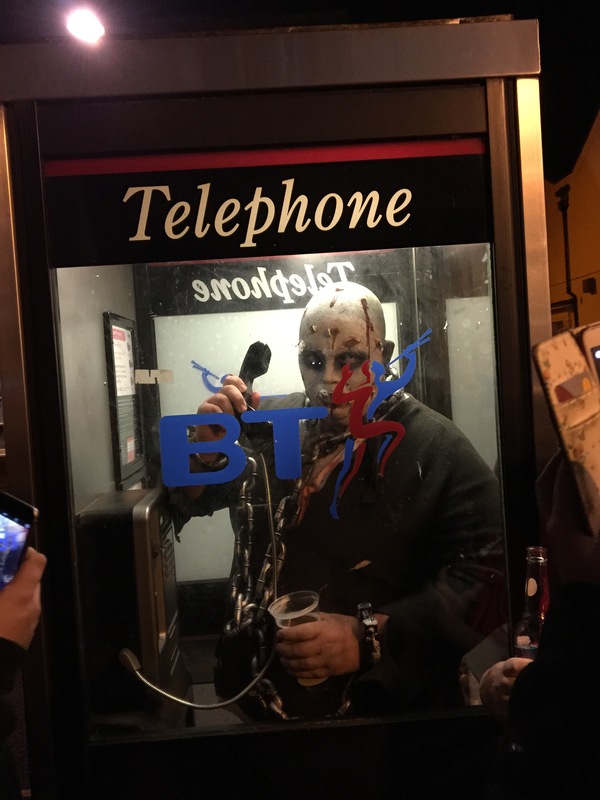 Cars being driven by zombies were going up and down the high street and I even saw a very undead fella using the public payphone. Well over a thousand people were bustling in and out of all the pubs. This must have been exceptionally good for local trade and also for local charities Harry’s Rainbow and Kat’s Cure, who were collecting donations throughout the evening. I was warned away from the event in general by many people saying it would be an unpleasant evening, I’d be struggling to get a drink and unable to get into a pub. I really did not find that to be the case. Yes, it was busy at the bar but the staff were all hands on deck and they were focused. We did not wait for much longer than 5 minutes at every pub that we visited. The atmosphere of the town centre being so busy was really enjoyable. I know there is a loose plan that the hard-core zombies follow for the pub crawl but we took our own route. Starting at The Old George, moving onto The Plough and then finishing up at The Crown. We had fun in every place and felt like everyone we met, in costume and even those who were not, were full of cheer, super friendly and in a total zombie party mood. I can hear you saying that only three pubs was quite lacking for a ‘pub crawl’ but we spent quite a while at each pub we visited and by 11.30pm we were really ready to hit the AFTERPARTY! 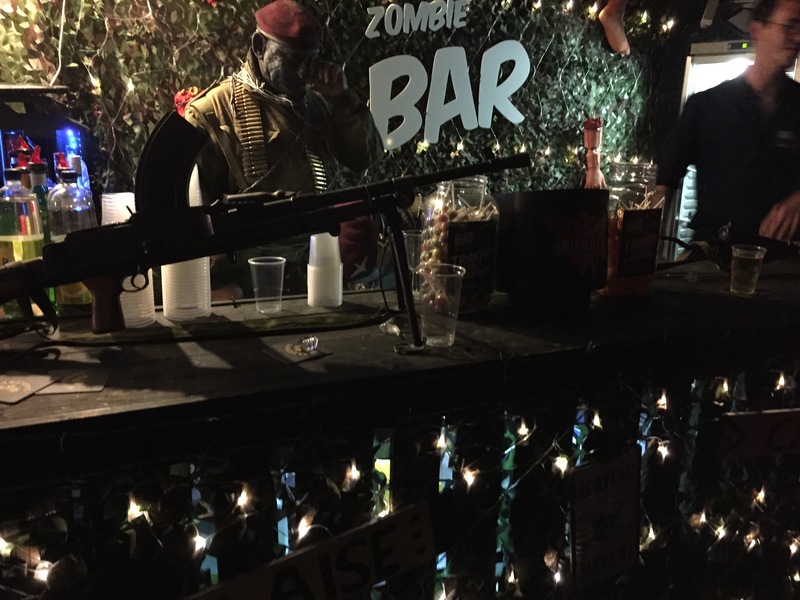 MK11 Live Music Venue in Kiln Farm was the official zombie pub crawl after party venue and they did not disappoint at all. When we arrived it was already full of guests and a covers band called Jukebox were on the stage. They were pretty damn good. We heard them cover tracks by Reef, Billy Idol and Guns n Roses to name but a few. Then DJs Rory and Joe took to the decks and they played a fab mix of alternative, rock and Halloween classics. The dance floor was packed but we had such a good time dancing until we couldn’t dance any more. We managed to hail a cab and by 4am we had hung up our costumes, removed our face paints and were tucked up in bed ready to sleep like the dead. I loved my first Stony Stratford Zombie Pub Crawl and I can’t wait to do it again.